Weekly Billing will allow you to create proposals that generate weekly invoices as well as weekly payments. If you haven't integrated your Practice Ignition account with an accounting package, good thing is, you can still use the Weekly Billing feature to collect weekly payment. How Do You Set Up Weekly Billing? 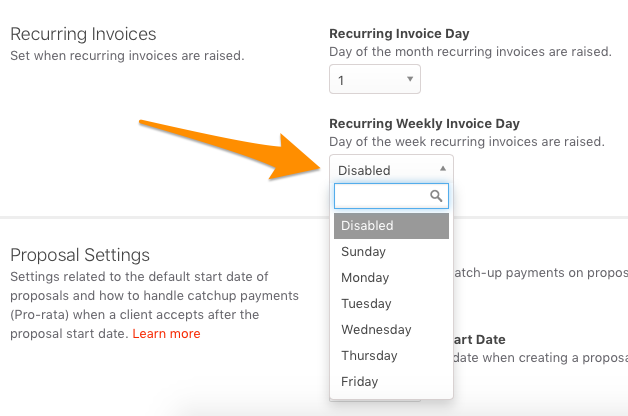 Go to Settings, then General, and select a Recurring Weekly Invoice day. This is the day of the week that your weekly invoices will be generated on. 2. Go to your Library then Services, and for each of the recurring services that are to be billed on a weekly basis, click to edit the service, and key in a Weekly Billing default price for each of them. How Does Weekly Billing Work? Create a new proposal by clicking on the Quick Add button at the top of the page OR by clicking on Proposals in the left hand menu and clicking New Proposal. From here, choose Weekly for the proposal's Recurring Period under the General tab. Please note: You can't have both weekly and monthly recurring services in the same proposal, you must make separate proposals.